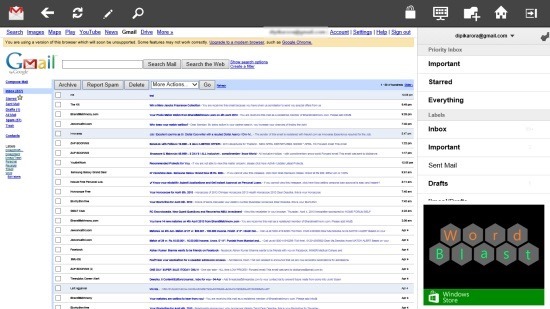 Gmail Touch is a free mail client for Windows 8 available under ‘Productivity’ category of its app store. This Windows 8 mail client app lets you login to your Gmail account, view inbox, search for mail, compose mail, and much more. You can login to multiple Gmail accounts simultaneously and can manage it easily. The interesting thing about Gmail Touch app for Windows 8 is that it alerts you with a toast notification whenever you receive a new mail. There are various options given within the mail client for Windows 8. As you right-click anywhere on the screen, you will find a horizontal bar at the of the screen including icons for refresh inbox, compose mail, search mail, view desktop site, login with another account, home, and logout. Let me quickly point out the main features of this mail client Windows 8 app below. Lets you login to your Gmail account, view inbox, search mail, compose mail, and more. Lets you login to multiple Gmail accounts and check all of them, simultaneously. Alerts you with a toast notification whenever you receive a new mail. Options such as refresh inbox, compose mail, search mail, view desktop site, login with another account, home, and logout. Lets you view you inbox in snap mode. Comes up with live tile. Well.. Gmail Touch is very useful if you want to keep tracking your inbox all the time. It alerts you with toast notification as and when you receive a mail. You can easily download this mail client for Windows 8 from the ‘Productivity’ section given in the App Store. Also, check out our posts on Customized Mail, Email Myself, and Chat Apps. Open this given link in Internet Explorer10 and click on ‘View in Windows Store’. As you click on ‘Install’ button, the downloading will start instantly and you will soon find the app in your Windows 8 Start Screen. In short, Gmail Touch is a good utility mail client for Windows 8 where you can mange your multiple Gmail accounts without touching the browser. Go ahead and download Gmail Touch app in Windows 8 now.